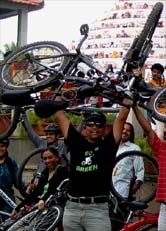 GoGreen Endurance Ride towards Turahalli Forest 24Jul10 - GGI-Group size: 4000+ Professionals, Increasing on day to day basis, Come & join us 2 serve Mother Nature. towards the forest, we changed our plan we started moving further. We could see the Omkar hills on our left- thats when we realised that we were close to Kengeri. We moved further to explore this route (as none of us had come this way before) and we reached the Uttarahalli main road. agar. 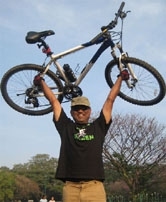 As soon as we touched Uttarhalli main road, there was a steep uphill. As the distance was not too long, we cleared it. 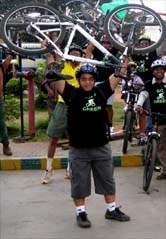 There were quite a few on the way till we reached Uttarahalli. Apart from the uphills, we were now also seeing lot of traffic esp the BMTC buses. From Uttarahalli, we took the route that connected Kankpura road. We stopped for IVC at Vasanthpura. We were quite exhaused (with the uphills, of course) and hungry. We enjoyed the steaming hot Thatte Idlis and the tea. Next to the joint, was an open ground with surpisingly a circus tent. Saw an elephant too. Do not remember when we last saw the circus - I was just thinking how this could have missed the 'Animal lover' groups !! We took the route of Isro Layout, K'pura road, Puttenahalli and reached back at JP Nagar by 8.30 am clocking a distance of about 30 kms.